The great Sherlock Holmes himself would sense his powers of deduction and observation being stretched to their limits on our Baker Street Treasure Hunt bash. Modesty forbids that we should shout the praises of just how good this team building quest is, but - IT'S BRILLIANT! Unless, of course, you suddenly find that your deductive powers have deserted you and your observational skills have gone AWOL in which case, well...let's just say the case will, most certainly, remain unsolved and the game will, most definitely, be anything but afoot. However, since that is not going to happen, you're in for a real treat of a treasure hunt that will introduce you to some wonderfully leafy squares and some delightfully quaint mews as you pit your wits against the competition in search of the answers and solutions to a series of challenges and questions that will set the synapses well and truly a-tingling. In order to put you into the right frame of mind for the challenge that lies ahead, you will begin your quest alongside the statue of Sherlock Holmes, which has graced the forecourt of Baker Street Station since...oops, we can't tell you that as it may be one of the challenges that you will need to work on in the course of the Baker Street Treasure Hunt. But, can there be a better or more fitting location at which to begin a hunt for the solutions to a series of cryptic clues and the answers to a range of observation questions and photo challenges? The great thing about the Baker Street area is, just how many fascinating people have lived or lodged in the neighborhood. Dodie Smith, for example is one person you'll encounter. Who's she? You may be asking. Well, she only went and wrote 101 Dalmatians. That's who she was. John Lennon and George Harrison are two other names that have found their way into our little quest. Thomas Lord, who gave his name to a certain nearby cricket ground is another. If you add in the likes of, the comedian Kenneth Williams, the author Wilkie Collins, the Earl of Oxford, and the jolly, bearded chap you can see to the right - well, you can see that you will be mixing and mingling with some of the crème de la crème of bygone London. But the challenge for you and your team mates will be to figure out exactly how they slot together and fit into the greater scheme of things. Because, only by paying attention and being constantly on the look out for their - often fleeting - appearances will you be able to connect the dots, slot the pieces into place, and use them to steam on to achieve ultimate victory. Where passersby are encouraged to sing along with a musical work? What Sir Richard Wallace gave fifty of to the city of Paris in 1872? Which record holder sped out of the area in search of fame and fortune in 1920? 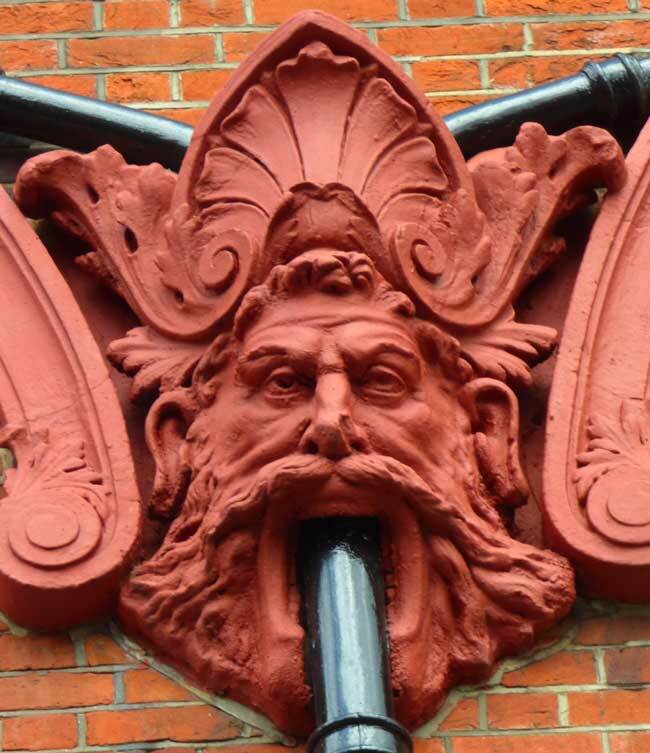 Why the face to the right has a drain pipe sticking out of its mouth? How the founder of Bolivia ended up on the Baker Street treasure hunt? Whose flat John Lennon was staying in when the long arm of the law came knocking on the door? It matters not if you know - or, for that matter, if you don't know - the answers to these conundrums now - because, by the time you cross the finishing line and sit down to slake your thirst - no doubt with the same enthusiasm with which you slaked your curiosity in the course of the treasure hunt - you'll, hopefully, know the answers to all these questions, and to many more besides. The above examples of some of the things you must find sum up wonderfully what the Baker Street treasure hunt is about. It's not about racing round to show that you are faster than the other teams but, rather, it's about looking, observing, seeing and finding. You will have to work with your team mates to ensure that not one blue plaque goes unnoticed; not one information board is left un-perused; not one secret mews remains un-entered; and not one snippet of information escapes your observation. But, to do all that, you will have to look around you as you pick your way through the streets of this fascinating part of London. Indeed, your head will need to swivel in all directions - up, down, left and right to seek the solutions to the challenges that you will be set. They're there, but it will be up to you to locate them. And, as you do so, you'll start to see things that you may have passed a thousand times before, but which you never actually noticed. In essence that is the mark of a fun treasure hunt. Getting you to slow down and to take in your surroundings and, as you do so, you'll make an amazing discovery - this little part of London has so much to offer that is intensely intriguing and fundamentally fascinating. Indeed, we can guarantee that, once you've delved into the hidden enclaves around Baker Street, you'll be itching to return and explore it at your leisure, and under less demanding circumstances than attempting to find the clues, seek out the observation questions and uncover the photo challenges before the opposing teams do. We've selected a great pub to end in. For a start it has the distinction of being one of the neighbourhood's oldest hostelries, and is a true time capsule inside. It was also once a favourite with The Beatles when their record company was based in one of the nearby squares. Will you love this finishing venue? Yeah, yeah, yeah! So, if you're look for an enjoyable, but challenging, team building event, during which you must pit your wits against opposing teams whilst, at the same time learning a great deal about the Baker Street area, then give this treasure hunt a go, and see if you can solve the clues, work out the challenges and hunt down the facts that will put you on course to absolute and undisputed victory. 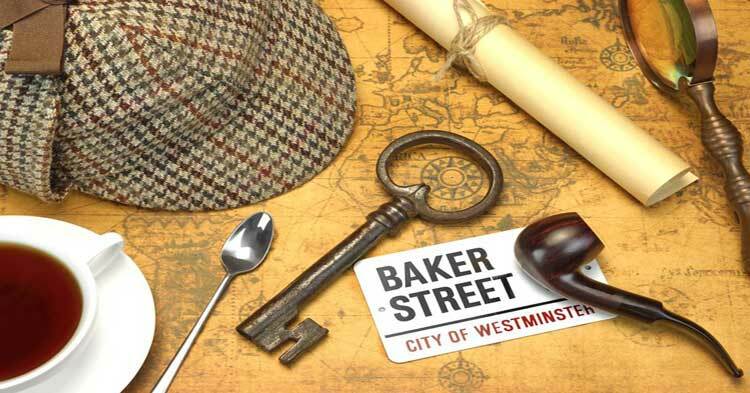 The cost of the Baker Street Self Managed Treasure Hunt Package is £140.00 for 4 packs.